Your advice has been invaluable. I have done my first painting of a dog (commission) and was wondering if you would mind giving me some advice on the background colour which is currently insipid, muddy and too busy. I'm think of changing it to one colour with subtle tonal differences but am stuck on which colour to use. If you're happy to give me your opinion, I could email you the photo or try and upload it somewhere and send you the link. Not sure how you can upload an image on a blog, but you can try uploading it on my Facebook page. Generally, I would avoid dark colours if the dog is dark-furred and likewise if it is pale. Look out for anything that might clash. Introduce a contrasting element in the background colour. If the dog has warm colours, such as rust or autumn colours, use cool colours in the background. It is a good idea to vary the tone a little to avoid a flat and featureless area behind the pet. 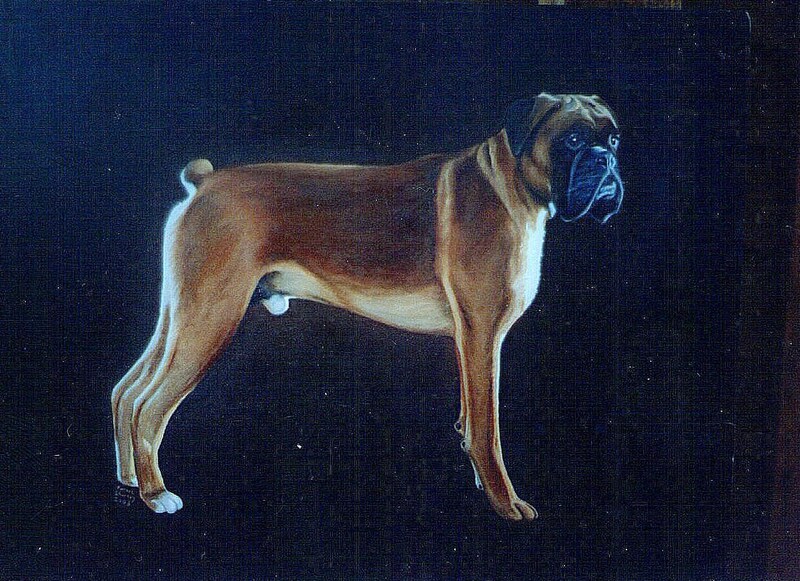 Rich, dark colours will bring out the highlights or flashes of pale fur on the dog, but try to use a background that informs on the dog's outline, rather than one that conceals it. Again, a contrasting element, whether in tone and/or hue might be a good idea. You are right to keep it simple and pare out the clutter. Thanks so much, Rachel. Your advice about contrasting light and dark is good. I started with a lighter Burnt Sienna background and have progressively got darker. Here's a progression so you can see how the background started out. Original photo: http://www.virtuallee.co.uk/Original.jpg (you'll see there are lots of blues and purples in the white fur. I used Burnt Sienna, Ultra and touch Alizarin/Cadmium red). Unfortunately used Black and Cadmium Red for the dark on the head (to get mahogany) - then found out I shouldn't use black :( I will try go over with Ultra/Burnt Sienna combo. Stage currently at: http://www.virtuallee.co.uk/3-October2013-cropped.jpg (I used Burnt Sienna and Ultra with touch white for the background and left some of the original Burnt Sienna areas). The main bg colour is a dark green/blue. Thanks so much for your advice. I very much appreciate it.